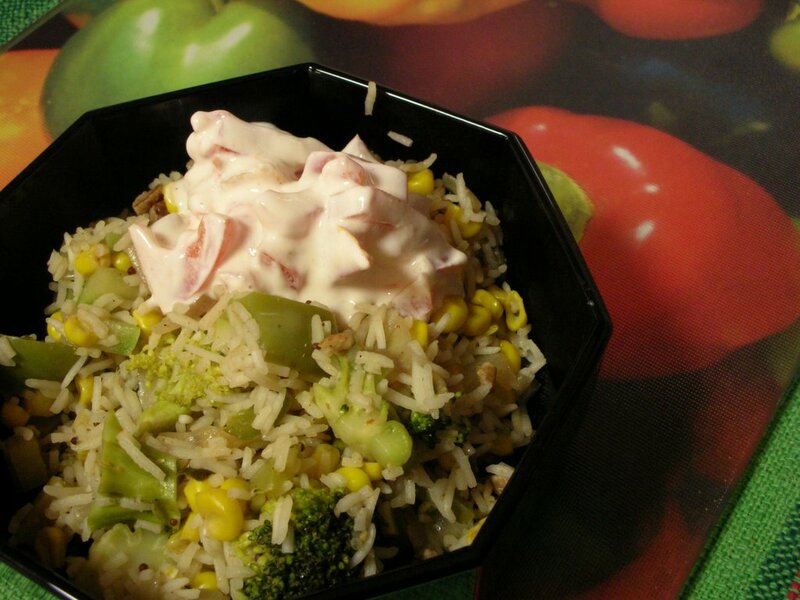 Today's Vegetable Recipe: An Indian-inspired rice dish made with leftover vegetables and served with raita. Side dish or vegetarian supper. In order to adhere to The Starch Rule, I managed to break The Leftover Rule and yes, sadly, The Chili Rule. The Starch Rule = Reverse the proportion of starch:vegetables from the typical 4:1 to 1:4. The Leftover Rule = Never ever-ever-ever end up with more leftovers than started off with. The Chili Rule = Just because the cook's unaccustomed to (and wary about) prolific use of chiles doesn't mean she shouldn't just seize the day and figure them out, especially when a delicious-looking recipe calls for a bunch! All that said, this vegetable pulao -- cooked first on the stove and then finished in the microwave -- is an absolute winner, a complete keeper. I especially loved the hot rice paired with the cool tomato/yogurt raita. Many thanks to the effervescent Shammi from Food, in the Main for her pulao inspiration and coaching! Here's what she taught and I (call me Alanna, call me Whatever, just don't call me Late for Supper .. as my English grandfather was wont to say ... ) was happy to learn! "The word Pulao (or pilau, pilao, pilaf, etc) is derived from a Sanskrit word, 'pilaaka'. Sanskrit is the Indian equivalent of Latin, being basically a dead language kept alive and spoken by a determined few and taught in some schools. Anyway, 'pilaaka' means 'bowl of rice. About the pronunciation - nope, the accent is on the second syllable ... that is, a short 'pu' (as in 'pull') and 'lau' pretty much as in 'loud'. Back to the recipe, though - you might find that adding one green chile - de-seeded and chopped very fine, or slit 3/4 of the way to the stem end - will give a bit of heat to the pulao without killing your taste-buds." And Nupur from One Hot Stove (who has so far written A through I in a fascinating A-Z exploration of Indian cuisine from the state of Marathi) added this: "Pulao IS pronounced exactly as you think 'poo-lou' and the word simply means 'flavored rice'. Pulao is the same as 'pilaf' as it is known in mid-eastern cuisine. I don't know of dessert pulaos, but they can contain a wide variety of vegetables and meats. Some typical pulaos are vegetable pulao, egg pulao and meatball pulao. It can be served as an entree or a side dish." Pulao (say it twice now, accent on the second syllable!) is a terrific way to use up bits of leftover vegetables. And while meat can be added, this version made for a satisfying vegetarian supper. Soak the rice in warm water for 30 minutes. While the rice soaks, in a large cooking pot (preferably one that can transfer to the microwave later), heat the oil. Add the garlic, ginger and chilies and fry for 30 seconds or so, stirring the whole time. Add the garam masala and onion, cook til the onion is soft. Add the diced vegetables and cook til soft, stirring as needed. While this cooks, combine the raita ingredients and refrigerate until ready to serve. If needed, transfer to a microwave-safe dish. Cook uncovered in the microwave for 10 minutes. Serve hot, garnish with cilantro and cashews, with chilled raita alongside. I just tried your roasted kale recipe and loved it. Look forward to trying out more, I already see so much I'd like to try.